As we get ready for our biggest fundraiser of the year, the 11th annual Sunday Supper, we at CUESA are focused on growing our newest educational initiative: Foodwise Kids. 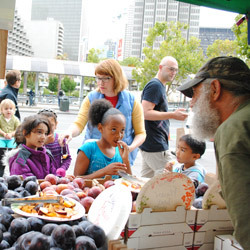 We are very proud of this innovative program, which uses the Ferry Plaza Farmers Market as a classroom for inspiring children to love vegetables and fruits through comparative tastings, exploring the market, and a hands-on cooking lesson in the CUESA Kitchen. Since we launched Foodwise Kids last year, 921 children from 32 classes have participated, primarily from San Francisco public elementary schools serving low-income students. The program has reached full capacity, and this fall, we have already had to place 26 classes on a waiting list. 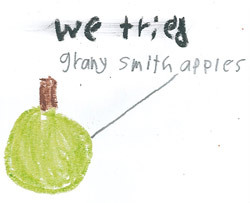 We hope to expand Foodwise Kids, so that more young students will meet a farmer, try a pluot or pomegranate for the first time, discover that Brussels sprouts are actually quite tasty, and eat a salad of their own invention. 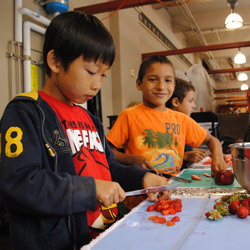 CUESA needs $26,000 to double the number of students currently served. We hope you will help us make this possible. By supporting the program at CUESA’s Sunday Supper on October 20 or by making an online donation in any amount, you can join us in cultivating a healthy future for the next generation of eaters. But don’t take our word for it. 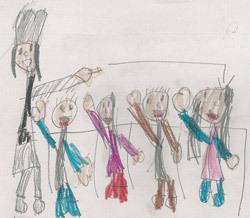 Read what kids and teachers have to say about how the program has impacted them. These responses have been transcribed verbatim, with adorable kid spelling and all! 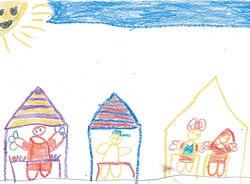 Please help us grow Foodwise Kids by attending Sunday Supper or by making an online donation.